I wasn’t yet familiar with the new toy line from JAKKS Pacific but my two boys certainly were. 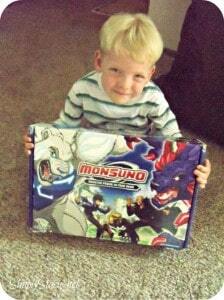 In fact, both my seven and four year old sons leaped up and down with excitement when the Monsuno Party Pack arrived. Monsuno is an animated adventure show on NickToons which the kids enjoy watching with their dad so they were very eager to check out the new toys. The new toy line was designed for boys (and girl fans) ages 6-10 and it features action figures, accessories, combat sets, collectibles, electronics and role play games so that the kids can bring the show to life through imaginative play. 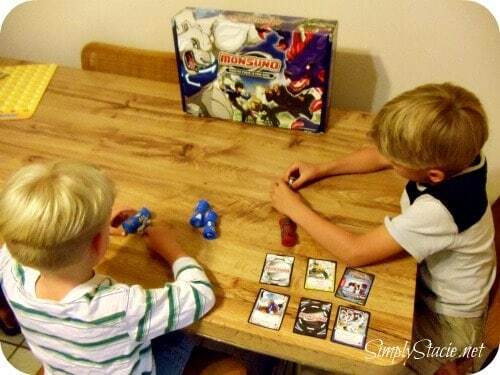 The boys invited over their neighborhood friend to play with their Monsuno toy party pack. This ultimate starter kit includes lots of really fun products from the toy line. My boys loved discovering what each piece in the set does and they had a blast role-playing for over an hour and a half. The trading cards are a big it and they really liked the collectible metal cores and action figures too. My seven year old son was able to read the instructions and with a bit of help from the adults quickly learned how to play the game. Even my four year old son was able to “play” along with the older children by making up his own rules and he loves it. They have asked to play with their Monsuno set every single day since it arrived. You are invited to visit Monsuno to learn more about all of the creative and fun toys in the new line. The Monsuno boy’s toy line is available for purchase at major retailers like Toys R Us , Walmart, Walgreens, Kmart and more as well as online at Amazon.com.